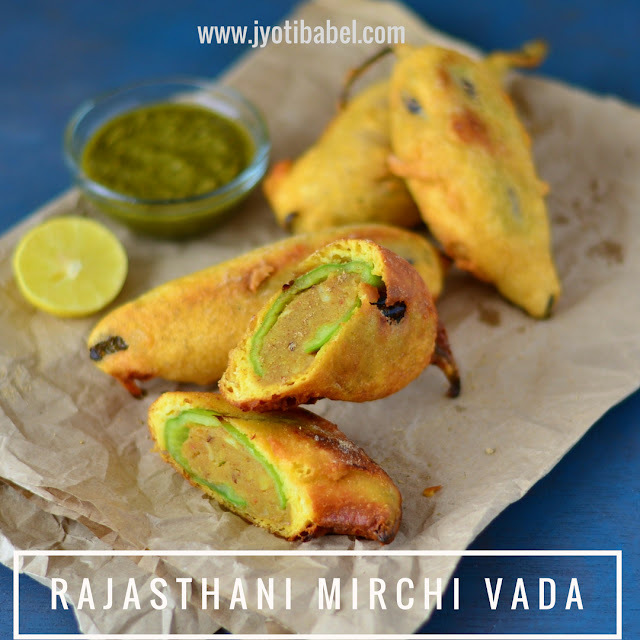 Without much ado now, let's check out my recipe for Rajasthani Mirchi Vada. Generally, the Mirchi Vada from Jodhpur is very spicy and tangy with a generous use of amchur and red chilli powder. I have toned it down to suit my taste buds. 1. Make a deep cut into the chillies vertically and using a spoon remove the seeds and pith from inside. Keep the top of the chillies intact. 2. In a pan heat oil. When heated, add hing, minced green chill, ginger and sauté for a few seconds. Add the mashed potatoes and all the spices and salt. Stir to mix nicely. Let it heat through for 2-3 minutes and turn off the heat. 3. Meanwhile, prepare the thick batter for coating the fritters by mixing besan, salt, and baking soda with water as needed. Whisk it well to make it lump free. 4. When the potato filling has cooled down a bit, stuff the filling into the slit chillies. You should be generous in stuffing it. 5. Heat oil for frying in a kadhai. When the oil is heated through, dip the stuffed chillies in the batter and deep fry them in the oil, till it is golden brown in colour. 6. Depending on the size of your kadhai, you can fry 2 or more at a time. 7. When all are done, serve them hot with a generous sprinkling of chaat masala along with green chutney and imli chutney for best taste. This is my entry for BM#89 Day 2 under the theme 'Stuffed Dishes'. For Day 1, I had posted Stuffed Cauliflower Paratha. Ultimate mirchi vadas, just irresistible and dangerously addictive definitely. Mirch vadas tempts me a lot. Mouthwatering. It is funny how rain always makes you want to munch on vada or bhaji. Very nice pictures. 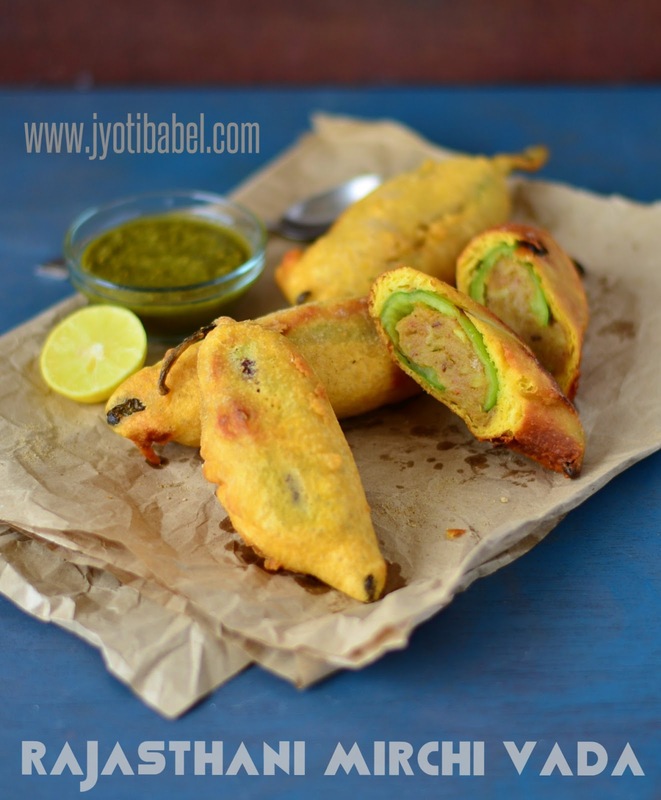 This is one tempting mirchi vada,perfect with a cup of tea especially on a rainy day. These mirchi vadas served with chai sound like what you need on a rainy day. They look so perfectly made, jyoti. Wow those vadas stuffed with aloo looks so yum!..While we do have some popular versions of this in our cuisines, I found this different because of the spices used..very nice one! I love these mirchi vadas , Jodhpur is definitely a hub for these and Kachoris . Perfectly made , these vadas are tempting me and I am drooling ! Potato filling for mirchi bajji would definitely be loved by all. Fantastic presentation. Wow such tempting bhajiya's ..Use to make them a lot earlier. Your pic is tempting me to make them again. This is a mirchi vada that I to try. Its been in my mind for a ling time, but never got around making it. Looks so delicious Jyoti! What a scrumptious treat! This mirchi Vada with chai is always welcome. Mirchi Vada looks amazing and cant take off eyes from the lovely snaps. Little different from the regular vada we get here.. Loved this version.. Lovely clicks. This is so perfect for the ongoing monsoon....looks delicious and would work awesome with a cup of chai!